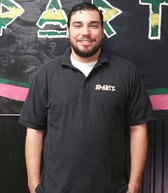 Ryan’s background in corporate store rebuilding along with his love of anything electronic made him a perfect candidate for our growing Vacaville location. A graduate of Dixon High School he was an all league all conference outside linebacker and lead their entire football conference in tackles two years in a row. He tried and played football for College of the Siskiyou. Ryan is currently attending ITT technical institute working towards his bachelors degree in electrical engineering.